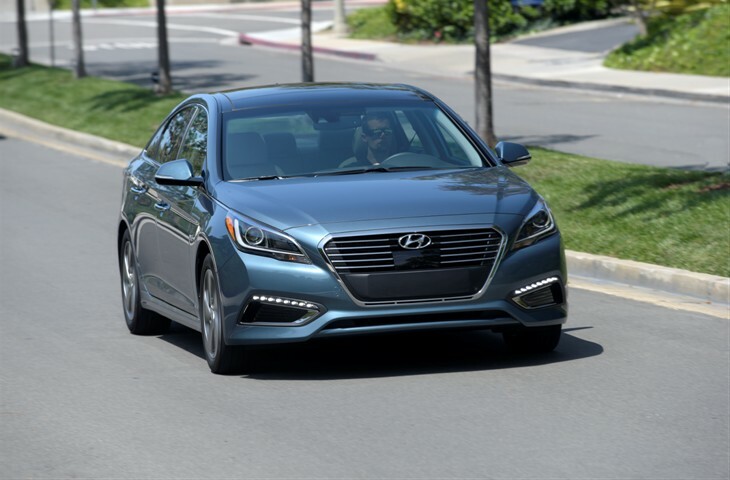 The 2016 Hyundai Sonata Plug-in Hybrid Electric Vehicle (PHEV) is projected to travel up to a class-leading 27-mile All-Electric Range (AER) and can recharge in less than three hours with a Level-Two charger. Wanna learn more? Although the Sonata Plug-in Hybrid is very technologically advanced, it will behave similarly to the regular Sonata Hybrid from the driver’s seat, but with the additional benefit of all-electric range. A 9.8 kWh lithium polymer battery pack, roughly five times larger than the Sonata Hybrid’s battery, is expected to give Sonata Plug-in Hybrid an all-electric range of up to 27 miles, farther than any other midsize PHEV sedan. Sonata Plug-in Hybrid uses a six-speed automatic transmission with Hyundai’s Transmission-Mounted Electrical Device (TMED), a 50 kW electric motor, in place of a torque converter. The 50 kW electric motor is 32 percent more powerful than the motor used the in Sonata Hybrid and allows EV operation at higher engine load and speed. A 2.0-liter Nu four-cylinder GDI engine coupled with the electric motor allows the Sonata Plug-in Hybrid to operate just like the Sonata Hybrid once the onboard battery charge is depleted. Sonata PHEV’s Nu engine produces 154 horsepower and 140 lb. ft. of torque and the total system output is 202 horsepower at 6,000 rpm. Sonata PHEV is expected to deliver 93 MPGe combined in EV mode based on internal estimates. In charge sustaining mode, the Sonata PHEV is expected to return 40 mpg combined based on internal testing. Recharge time ranges from less than three hours at a 240V Level-Two charging station to less than nine hours using a standard 120V outlet. Sonata Plug-in Hybrid uses the same functional design changes as the Sonata Hybrid to improve its drag coefficient to a class-leading 0.24 as well as provide visual cues to distinguish the hybrid models from other Sonatas. Visual changes to the Plug-in Hybrid’s exterior include a charging port on the driver front fender, unique grille, front and rear bumpers, front fenders, front and rear lights, chrome side sill moldings, Hybrid badging and an eco-spoke alloy wheel design. A distinctive instrument cluster provides Plug-in Hybrid drivers with additional information about the Plug-in Hybrid’s functions. A charge indicator is located on top of the dashboard to make it easy to see the state of charge from outside the vehicle. Sonata Plug-in Hybrid will offer four exclusive exterior paint options: Pewter Gray Metallic, Diamond White Pearl, Eclipse Black and Seaport Mist. Interior color choices include gray in cloth or leather seating configurations and an all-new Blue Pearl option for leather seats. Sonata Plug-in Hybrids equipped with Blue Pearl leather seats will include contrast stitching and trim accent pieces. Owners can manage and monitor the Sonata Plug-In Hybrid Electric Vehicle remotely via an exclusive Blue Link smartphone app. With the app, owners can access real-time data from their Sonata PHEV and perform specific commands like starting the engine and locking doors. Plus, users can search for points of interest using Google with voice or text and have the directions when they start their Sonata Plug-in Hybrid. All 2016 Sonata Plug-in Hybrids come standard with iPod®/USB and auxiliary input jacks, SiriusXM® satellite radio and Bluetooth® phone connectivity with phonebook transfer and voice-recognition. The 8.0-inch navigation system features downloadable apps, HD radio and available Infinity premium audio system. Hyundai’s 8.0-inch navigation system offers an enhanced display with improved touch sensitivity, a map and music split screen display and the ability to record SiriusXM presets 1-6. Switching to a preset station in the middle of your favorite song won’t be an annoyance any longer. Rewind up to 22 minutes to listen to the full song or catch up on a sports broadcast. SiriusXM Travel Link® provides access to traffic information, sports scores, weather, stock prices, fuel prices and local movie times. All 2016 Sonata Hybrids equipped with navigation will also support Pandora® and SoundHound applications as well as “Eyes Free” Siri integration, which allows drivers to perform a variety of functions without taking their eyes off the road. The Sonata Plug-in Hybrid will be available in California, Connecticut, Maine, Maryland, Massachusetts, New Jersey, New York, Oregon, Rhode Island and Vermont in 2015. Sonata Plug-in Hybrid buyers will be eligible for a $2,500 fixed federal tax credit and a variable federal tax credit based on battery capacity that will also be over $2,000. These tax credits reduce the amount of federal tax the purchaser is liable for, making them much more valuable than tax deductions. Local incentives may also be available, for example, the clean vehicle rebate in California is an additional $1,500 and Sonata Plug-in Hybrid is eligible for California’s Green Clean Air Vehicle Decals that allow access to the HOV lanes. The Sonata Plug-In Hybrid has a MSRP of $34,600 but with the Federal Tax Incentive of $4,919 brings the net MSRP to $29,681. The Limited is $38,600 but after the Federal Tax Incentive, it’s $33,681.